Racing clutch kits are specifically designed for vehicles involved in the motor sport and racing industry. They are engineered using the highest quality components to ensure failure rates are minimised at high RPM. - Sports Organic - specifically designed to prevent failure at high RPM and to provide excellent durability and engagement. The disc has a premium friction material for superior durability as well as high rate damper springs to handle increased torque. - Sports Ceramic - The Race ceramic disc is lightweight and has a special metal button design, specifically for drift, rally, circuit and drag racing. The disc has a thinner design, and lightweight components helping to reduce wear. Hyper Metal Series- available in single, twin and triple clutch options. It is designed in lightweight materials for increased engine response and engagement. It is available in both push and pull type clutch systems for a variety of vehicles including Japanese, European, as well as V8 Ford and Holden sports models. Hyper Carbon Series- originally designed for Formula 1 racing, the carbon series is available in single twin(dual) and triple, as well as with dampers. The carbon material has a lower likelihood of shuddering on engagement. 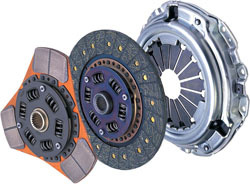 They provide easy clutch use in high horsepower situations and are suitable for street and track use. Flywheel - the flywheel is an important element in clutch performance. When replacing your clutch kit, please check your flywheel for wear and tear. Exedy have a high quality racing flywheel available if you decide to go with a lighter flywheel. If you have any queries about which racing clutch kit is best suited to your vehicle, please ask us, we are clutch and transmission specialists with over 39 years experience in the motor industry in Australia. We have raced our own vehicle in NSW off road racing championships. **NOTE: With any ceramic button clutch system, there will be some compromise of start-up driveability when compared to a standard clutch kit. Most evident will be chatter on light throttle, and low RPM start-up, in addition to an increase in cabin and/or transmission noise. These issues are generally deemed acceptable in modified performance cars. Drivers of vehicles fitted with cerametallic clutches on the street should not ride the clutch or try to reduce the chatter as this will greatly increase the wear rate.